Tottenham Hotspur are reportedly weighing up an approach to sign Watford's Abdoulaye Doucoure during the forthcoming winter transfer window. 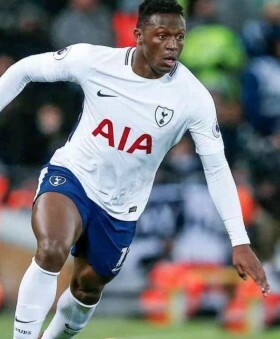 Kenyan international Victor Wanyama looks set to depart Tottenham in the January transfer window, with the likes of Serie A duo Sampdoria and Genoa both in the race to sign the defensive midfielder. Former Southampton and Celtic player Wanyama has two and a half years remaining on his Spurs contract. Belgium international Mousa Dembele is among the leading contenders who could part ways with Tottenham Hotspur at the turn of the calendar year. Borussia Dortmund are reportedly planning an approach to sign Kenya international Victor Wanyama from Tottenham Hotspur. Liverpool want Victor Wanyama to replace Emre Can? Liverpool are reportedly eyeing a surprise deal for Victor Wanyama, who has been earmarked as a potential replacement for Germany international Emre Can. Tottenham Hotspur will look to avenge their derby defeat earlier in the campaign when they host Arsenal at the Wembley Stadium this afternoon. Tottenham Hotspur could lodge a move to sign midfielder Ross Barkley from Everton during the winter transfer window. The England international is also deemed a target for Premier League champions Chelsea. Tottenham Hotspur are shock candidates to sign Arsenal's out-of-favour midfielder Jack Wilshere when the England international's contract expires at the end of the season. Wilshere, who spent last season on loan at Bournemouth, has been edging closer to regular first-team football with the Gunners this season. Tottenham Hotspur are set to offer £27 million to Barcelona for attacking midfielder Denis Suarez and hijack Serie A side Napoli's attempts to sign the 23-year-old. Suarez was signed from Manchester City's youth team in 2013 but has struggled to make the transition to Barcelona's first team. Liverpool are reportedly hoping to trigger the release clause of Southampton midfielder Dusan Tadic in the summer transfer window. It was an emotional farewell for Tottenham Hotspur on Sunday, as they played their last game at White Hart Lane against Manchester United, ahead of their move to Wembley next season due to the construction of their new stadium. Despite no longer having a title to fight for, they were determined to win this one, to assure they left their famous old ground on a high.